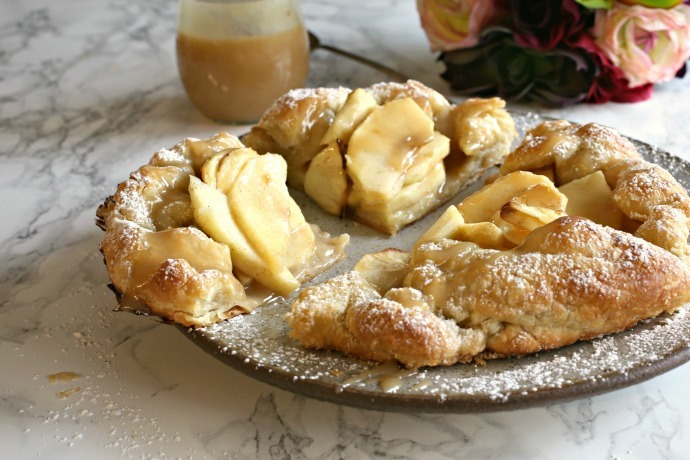 Not all Valentine's Day desserts have to contain chocolate. Especially if you suspect a box of your favorite chocolate truffles is being purchased for you because somebody knows how much you love them. So, on the assumption that somebody knows what's good for them and is purchasing said truffles, I think it's safe to move away from the chocolate. There should still be caramel, though. 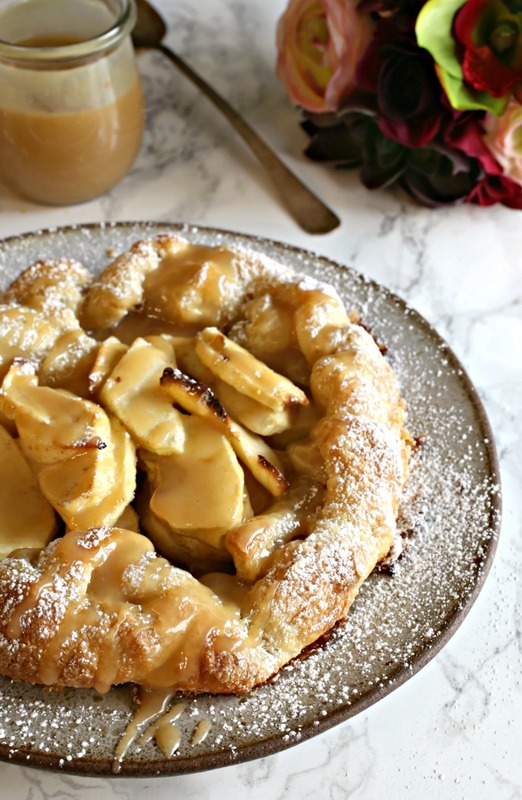 This shortcut apple dessert is much easier and faster to make than a standard pie because it uses a sheet of packaged puff pastry. The caramel, though, is homemade because it's so much better than anything store bought and because we're going to put tahini in it. 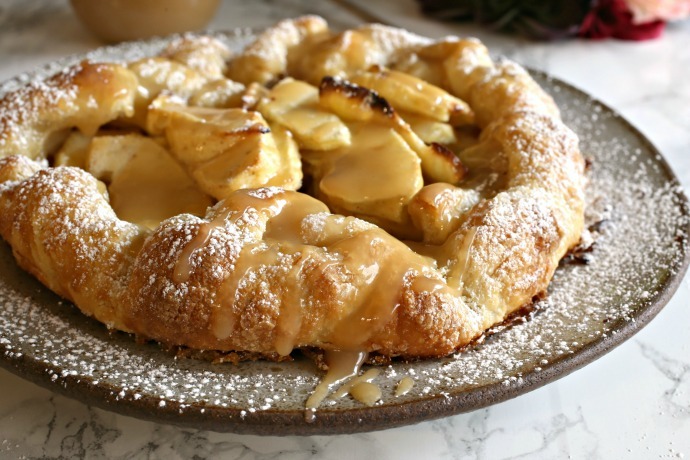 That bit of nutty, sesame flavor goes so well with apples and helps to tame the sticky sweet nature of caramel. I love tahini in both sweet and savory dishes and I've happily watched it become more mainstream as new brands enter the market. 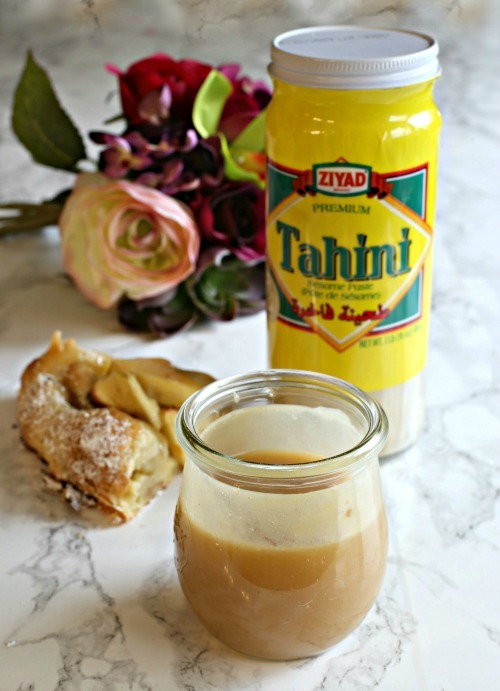 But my choice for this recipe was the Ziyad brand of tahini and they've been around for a long time. Ziyad's tahini is ultra smooth and silky with a gently roasted sesame flavor and high quality seeds. It's long been one of my favorites so I was pleased to see they were the top rated tahini by Cook's Illustrated a few months ago. This puff tart is best eaten fresh but you can make the caramel the day before. Store it in the refrigerator and microwave for a few seconds to loosen it before serving. Enjoy! To make the caramel sauce, add the sugar and water to a heavy bottom sauce pan on medium low heat. Allow the sugar to dissolve and then raise the heat to medium. Continue cooking for a few minutes until it starts to take on a light amber color but do not walk away because it can burn quickly. Pour in the heavy cream (the mixture will bubble up) and add the butter. Continue cooking and stirring until any lumps have dissolved and the mixture is smooth. Stir in the vanilla, tahini and sea salt. To make the tart, pre-heat the oven to 400 degrees. Toss the sliced apples in a bowl with the sugar, lemon juice, cinnamon and salt and let sit for about 5 minutes. Gently roll out the sheet of puff pastry just to remove any creases but do not flatten it too much or it won't puff. 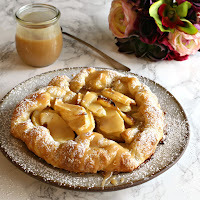 Drain the liquid from the apple mixture and pile them in the center of the dough. Fold the edges over to form a circle. Brush the edges with the cream and sprinkle with the teaspoon of sugar. Bake at 400 degrees for 15 minutes, then lower the heat to 350 and bake for an additional 15 minutes or until the pastry is lightly golden brown. Dust with powdered sugar and pour on the caramel sauce to serve. You can purchase all the Ziyad products, including their amazing tahini at many large grocery chains around the country or through their store on Amazon.